OroCRM supports out of the box integration with Zendesk, allowing you to load data from your Zendesk account and process it in OroCRM. This article describes how to define and edit the integration and synchronization settings. While Zendesk integration capabilities are pre-implemented, OroCRM can be integrated with different third-party systems. See a short demo on how to setup Zendesk integration, or continue reading the step-by-step guidance below. The only thing you will need from Zendesk is your API token. Open your account and go to the Admin page. Make sure the Token Access is enabled. Copy an active API token. Go to the System>Integrations>Manage Integrations, and click the Create Integration button. The Create Integration form will appear. Name* The integration name used to refer to the integration within the system. URL* A URL of your Zendesk account (e.g. https://username.zendesk.com). API Email* The email used to register your Zendesk account. API Token* The API token generated and/or copied in the Zendesk (as described above). Default Zendesk User Email User with this email will be assigned tickets that come from OroCRM and for which there are no Zendesk users with a matching email address. Owner Limits the list of users that can manage the integration, subject to the access and permission settings etc.) Used as an OroCRM user for Zendesk tickets if there are no users with a matching email address. Use the Synchronization Settings section to enable/ disable two way synchronization. Select the Enable Two Way Sync check box, if you want to download data both from Zendesk to OroCRM and back. If the box is left unchecked, data from Zendesk will be loaded into OroCRM, but changes performed in OroCRM will not be loaded into Zendesk. Remote wins—Zendesk data will be applied to both Zendesk and OroCRM. Local wins—OroCRM data will be applied to both Zendesk and OroCRM. 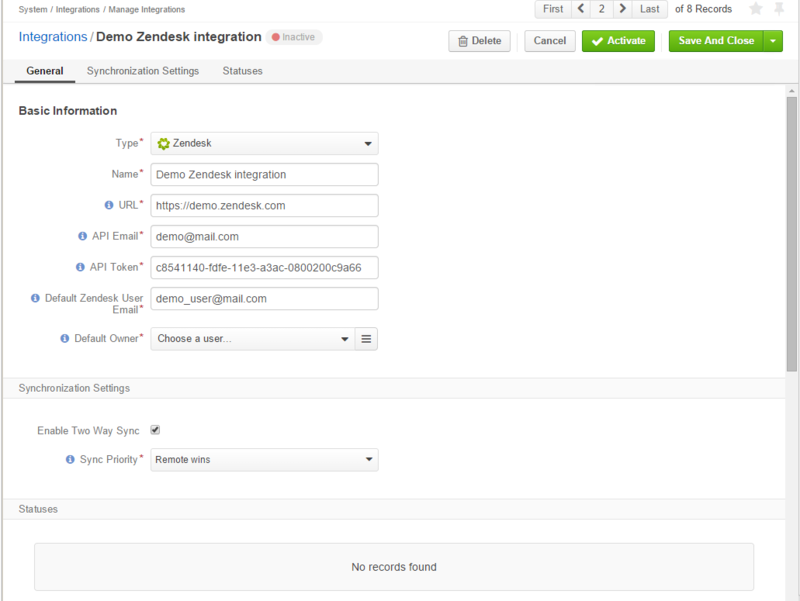 For example we have created a ‘Demo Zendesk Integration’ with two-way synchronization enabled. In this integration you have set that if the same data is changed from both Zendesk and OroCRM, the Zendesk changes will take precedence. Initially the integration is inactive. 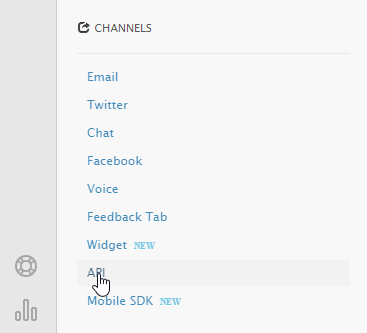 In order to activate it, click the Activate button on the integration view page. Go to the System>Integrations>Manage Integrations, and click the Reset button. Alternatively, go to the integration view page, and click the Schedule Sync button. A sync job has been added to the queue. Check progress. note will appear. The data is now being synchronized. You can click the Check progress link to see the synchronization status. If there is a matching email, the user is mapped to the Assignee field value. If there is no matching email, the integration owner is mapped to the Assignee field value. Ticket Number Zendesk ticket number. Used to determine if an existing case/ticket must be updated or if a new one must be created. Recipients Email Same as the Recipients Email field in the Zendesk ticket. Status Same as the Status field in the Zendesk ticket. (Does not map to the OroCRM statuses). Type Same as the Type field in the Zendesk ticket. If there is a matching email, the contact is mapped to the Submitter field value. If there is no matching email, a new contact is created and mapped to the Submitter field value. The mapped OroCRM contact name and the link to it are displayed as a value for the Submitter field in the ticket created in OroCRM. (So, for example, if the ticket was submitted by user ‘DreamWorks Founder’ in Zendesk and the user’s email matches the email of the OroCRM Contact ‘Steven Spielberg,’ the Submitter field in the OroCRM ticket will be filled with the value ‘Steven Spielberg’). If there is a matching email, the user is mapped to the Submitter field value. If there is no matching email, the integration owner is mapped to the Submitter field value. If there is a matching email, the contact is mapped to the Requester field value. If there is no matching email, a new contact is created and mapped to the Requester field value. Priority Same as the Priority field of the Zendesk ticket (Does not map to the OroCRM priorities). Problem Same as the Problem field in the Zendesk ticket. Collaborators Same as the Collaborators field in the Zendesk ticket. If two-way synchronization is enabled, Publish to Zendesk will be available in the Case View page. Click the button and the case will be submitted to Zendesk. If there is a matching email, the ticket is assigned to the related user. If there is no matching email, the ticket is assigned to the user with default Zendesk user email. After the ticket has been created in Zendesk, its details are saved in the Ticket related to the case in OroCRM. Please note that reopening a ticket in your Oro application will not reopen the same ticket in Zendesk. In addition, tickets closed in Zendesk cannot be updated, even if changes to the ticket have taken place in OroCRM. If some ticket details of a Zendesk ticket have been changed after the initial synchronization, the corresponding OroCRM case details will also be updated in the course of the nearest synchronization. If some ticket details of an OroCRM case have been changed after the initial synchronization, the corresponding Zendesk ticket details will also be updated automatically (if the two-way synchronization is enabled). If the same details have been updated in a related Zendesk ticket and OroCRM case, and the two-way synchronization is enabled, the synchronization priority settings will be applied.